I had the privilege of working with 40 middle school social studies teachers last week. It’s the last few days of a three year Teaching American History grant and, yes . . . some teared up a bit towards the end. It’s been a great ride. We’ve all learned a ton – both content and pedagogy. Last week, we enjoyed the sweetness of working with three history studs – Mark Fiege, Elliott West, and Thomas Andrews – while also learning more about the best ways to incorporate their history content into actual lessons. Master Teacher Nathan McAlister walked us through a variety of learning activities including panning for gold, cutting up buffalo, and arguing pros/cons of fracking during a city council meeting. One of the smaller activities we did was a bit simpler and much easier for you to drop directly into your instruction. So I figured I would share it with all of you. Called Fact Pyramid Because Box, the activity asks kids to not just read but to evaluate and rank information and then justify their decisions. Seems like a perfect fit to encourage close reading and summarizing of primary source documents, textbook selections, fiction/non-fiction, and short articles. I’ve even used it to help kids focus on short video clips and images. It’s a great way to start focusing on Common Core literacy skills. The process couldn’t be easier. Select a document or text. As kids are reading they should be highlighting information that they believe to important. You should do a read-aloud with kids through the first few bits of the text to model how this should look. When the student is finished with the reading, they should have several parts of the text highlighted. 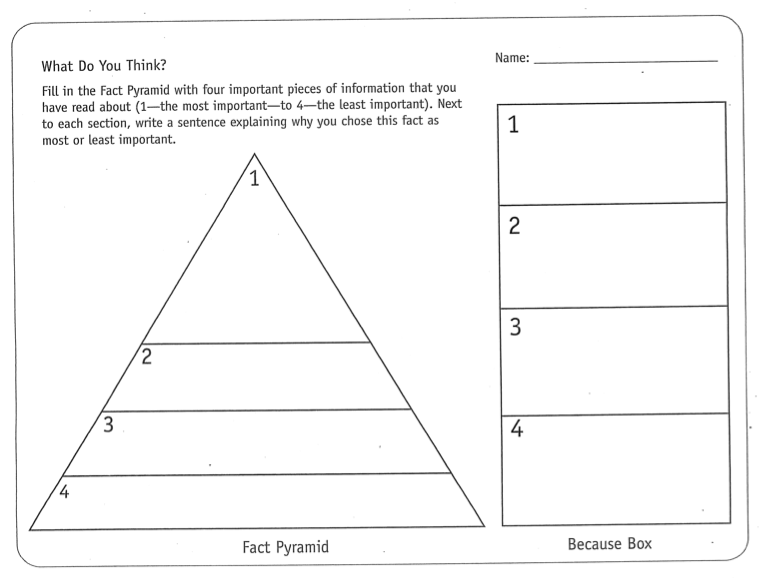 Taking out the Fact Pyramid Because Box graphic organizer, students then must rank the top four pieces of information from most to least important – filling in the Fact Pyramid portion of the organizer. Students then must explain in the Because Box why they placed those pieces of information in that particular order. You might also ask students to focus on a particular question or topic during their reading, finding evidence to support their answer. For example, you might have high school students read Carl Sandburg’s poem Chicago and ask them to look for evidence of the city’s connection to nature and the environment. Elementary students could look at images of Plains Indians and find evidence supporting the growth of the Horse Culture. Download a PDF of the graphic organizer here. Thanks Glenn! One of my big pushes at the beginning of each year is close reading, scaffolding, annotating texts. What’s the main idea? What supports that idea? I have a couple tools I use, but this could work as well, especially for my visual learners. I like the idea of ranking facts. It makes them wrestle with why writers put things where they do. What is the logic in composition? When they get to the end of the year and they are writing their larger projects then they see that writing is something you craft like a sculpture. Both inspired and logically worked out.